A still from Home Suite by katharine Fry. A site specific performance in seven parts. Part 1: “silliness”. Commissioned by the Collective. It wasn’t how I imagined. But what did I have to imagine if I knew so little about it? Can you visualise the unknown? In 2007 the Collective‘s purchasing panel embarked on a journey to commission a performance art piece. On the panel was myself, and Collective members Jo and Sam Eastop – three of the seven households represented. What it actually meant and how it would work across all the households was a complete unknown. All we knew for certain was that it would be a commission – the first the Collective had undertaken. But what were we commissioning? Where could we start? An important introduction to performance art for the Collective was the visit we made to Laura Godfrey-Isaac’s “Home” exhibition – an experimental gallery in a home space where in 1999 twenty one different artists were represented in her own family home. From the very outset the Collective was interested in new, experimental art that challenged – we didn’t particularly exclude any genre of contemporary art practice just because we were in a domestic space. But domestic spaces have obvious restrictions (not least we “live” there) however well meant the intention to create opportunities for living with contemporary art in whatever form it should take. Laura’s Home exhibition was challenging, especially where Franko B used blood as part of his work. It felt quite disturbing with few boundaries left between public and intimate which provoked some intense debate amongst us. But it didn’t deter us in our quest for performance art. First we began with a meeting with live art expert and curator Mark Waugh whose brief was to help us understand more about performance art, what we might consider and how we could go about commissioning the best artist for us. In fact what he succeeded in doing was so much more. He didn’t just inform us on some practicalities, but instilled an enthusiasm that propelled us forward full of anticipation on a quite unexpected journey. There would be no stopping us. We advertised, short listed, using a comprehensive matrix of criteria and interviewed three finalists. Of these three Katharine Fry emerged as our chosen artist. She stood out, both in what she had achieved already but how she talked through her ideas and wanted to involve all the Collective households. Katharine had big ideas and to realise the scale she needed more funds than we had available. 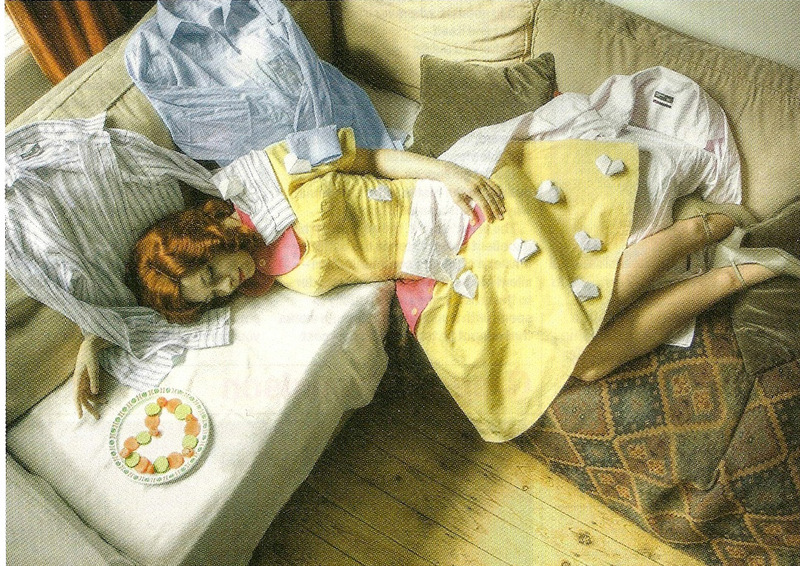 The outcome might have been very different if she hadn’t achieved her goal, but Katharine did find support through Arts Council England which welcomed the unusual concept of performance art within the domestic setting of the Collective households. So with increased funds she set about preparing and researching her ideas. 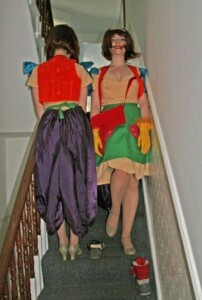 A still from Home Suite, a site specific performance in seven parts by katharine Fry. Part 6: “Seething”. Commissioned by the Collective. Each house was allocated a day and a named theme to chart the evolution and eventual fate of this relationship. Monday – Silliness; Tuesday – Seduction; Wednesday – seriousness; Thursday- Solitutde; Friday – Sorrow; Saturday – Seething; Sunday – Senselessness. It was stunning. We invited friends and interested public viewers to come and watch as it played itself out, filling our houses in each case with dance, routines, interactions with our domestic wares and spaces, sounds, lights, moments of perplexity and captured moments of inspiration as we all watched it unfold. In each house, the performance was significantly different in tone and feel – though the same seven dancers performed each time, with different costumes and choreographed to the surroundings with real skill. The story began, rose and ended in a gradual progression, each part quite unique and quite brilliant. And yet, none of us have anything physical in our houses to show that it ever happened. It can’t be repeated. A video shows edited highlights from the seven performances though not all the soundtrack is original. It can’t be re-sold. Yet we talk about it more than anything else we’ve done as a Collective, permanently etched in our minds as a series of experiences. The experiences didn’t confine themselves to the performances, but the creative process, the “making” and what was involved for each household. Collecting experiences is certainly part of this story. Working with the artist Katharine Fry, was fascinating but the creative process was often intrusive to our everyday family life. Home is a very intimate place where we reveal ourselves on many different levels, often not seen anywhere else. There were many visits to our homes, where there was a fine line between research by the artist and a feeling of exposure within our own “castle”. A gender divide emerged with the cataloguing of our personal belongings, the interruption to our children’s schedules and meals. As the rehearsals began I might come home to a full house of dancers, technician, helpers, videographer and all our kitchen utensils lined up on the table, furniture rearranged. We felt like visitors in our own home, the mere backdrop to a forthcoming event. The children looked confused, not sure where to seek shelter and desperately looking for pets that had run off in terror at the commotion. “why are these people in our house”? “It’s OK, it’s just performance art!” . At times, I wasn’t sure what we had embarked on, or how it would end. deduce from this reflective story of a relationship that was breaking down? Or the outdated representation of the “archetypal” housewife? Weren’t we all working women? Nothing, or something? It was a performance, it was art, it was a story, and we were free to read something deeper or just take it for what it was. The only difference was that it was in our own homes. Was our intimacy exposed? It left a deep impression on all of us. It altered domestic boundaries, it challenged and made us question objects around us and concepts we perceived. The final productions were fantastic. Isn’t that everything we’d hoped for?